Did eNCA put Pule Mabe’s teleprompter in the wrong place? 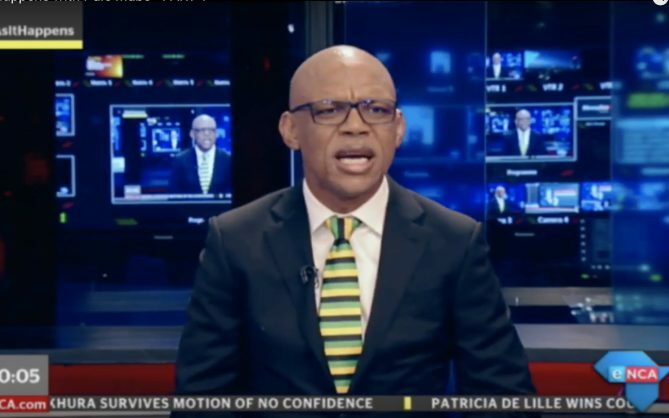 The ANC’s spokesperson became the second politician to act as a news anchor in the #AsItHappens primetime segment. ANC spokesperson Pule Mabe was the second politician to take the hot seat at news channel eNCA on Tuesday night after the EFF’s Dr Mbuyiseni Ndlozi’s stint on Monday night. Like Ndlozi, he used the first part of his time on the half-hour slot, As It Happens, to discuss a few points that were important to the ANC, such as the Gaza-Israel conflict and ANC governance issues. However, unlike Ndlozi, Mabe did not look nearly as comfortable and self-assured, and for some reason kept looking askance at his teleprompter, leaving one to wonder if some mischievous person in the studio had moved his teleprompter to the wrong place. It left the strange impression that Mabe wasn’t talking to the TV audience as intended, but rather to some unrevealed person in the studio. People on Twitter also noticed. There were other little mishaps, such as a slightly confused Mabe saying: “Welcome back,” right as the channel went to an ad break. Some people thought this was evidence of a conspiracy that the show wasn’t “Live”, as advertised. All of this, of course, is perfectly forgivable, but does give you an appreciation for professional news anchors who actually know what they’re doing. Mabe should probably stick to his day job. Following the ad break, Mabe interviewed Mahlatse Mahlase, the SA National Editors’ Forum chairperson, where the topics were fake news and the upholding of standards in the newsroom. In an obvious reference to Mabe’s own recent unhappiness at an “inaccurate” headline in a weekly newspaper that ran an exposé about him, Mabe asked Mahlatse why editors published headlines that were radically different to the facts in an article. Mahlatse said such actions were against the Press Code, and people could complain about it to the ombudsman. They could then get apologies and retractions in the event that the conduct was not in line with the code. Mabe became increasingly assured as the segment continued. By the end of the show, in the final segment when people called in, he was fortunately looking at the camera throughout. This #asithappens proves that Live TV isn’t a walk in the park.